The space is covered with thousands of delicate white paper tendrils and vines draping down from overhead. Beneath them stand dresses in all inspiration of flowers: from a chiffon afternoon dress embroidered with cotton daisies to one couture cocktail dress covered in little green feather sprigs. Facing these dresses on one side of the wall, a Monet iris painting is hanging as if in conversation with the gowns. 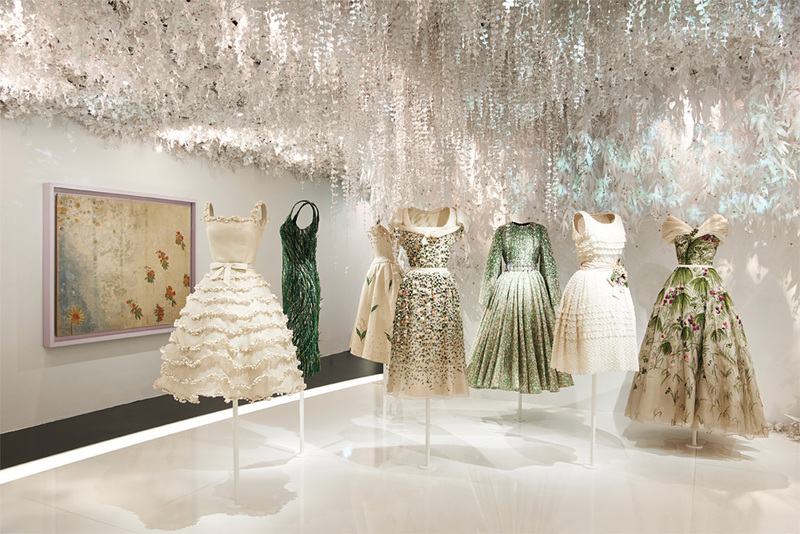 This is the Dior Garden, one of many rooms in the 32,000-square-foot ‘Christian Dior: Designer of Dreams’ exhibition at the Musée des Arts Décoratifs in Paris. 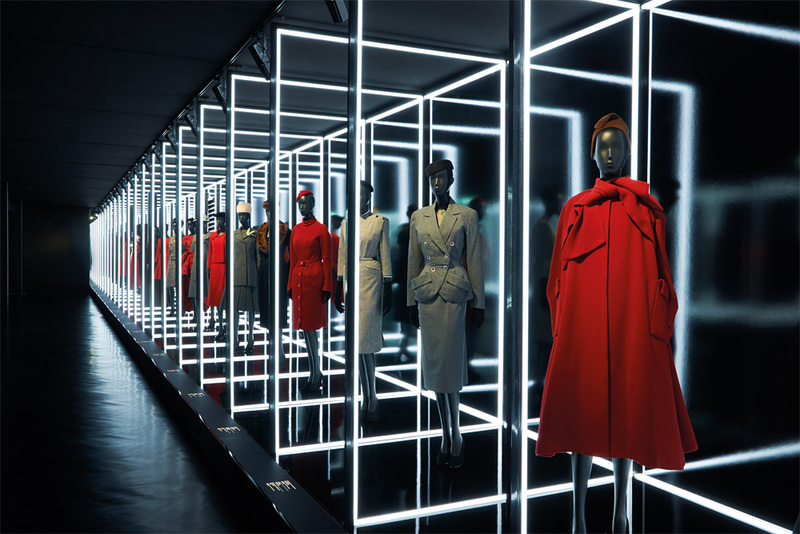 Celebrating 70 years of Maison Dior, it’s a big and bold staging of the brand’s story, and underneath that, a subtle retrospective study of the business in fashion. With over 300 haute couture dresses (many from the museum’s own collection) and 700 accessories across 23 themes curated by the museum’s director Olivier Gabet and Florence Müller, curator of textile art and fashion at the Denver Art Museum, it’s a one-hour minimum walk-through show. The superlatives continue … welcome to the largest Dior exhibition ever held, and the first in France since 1987. The first half of the exhibition unfolds at the fashion galleries with a breathtaking backdrop projection on the museum’s wall outlining the façade of 30 Avenue Montaigne, the maison’s first store and headquarters. At the top is an oval medallion with a video loop of Dior runway shows, past and present. As you walk up and enter the show, the first dress to stop you in your tracks is a “satan red” classic gown from 1947: wasp-waisted with a full, pleated skirt, this is the scandalous silhouette that women didn’t know they wanted at that time. It launched a new concept of luxury with its new lengths and new volumes. This “New Look”—so coined by then-editor of BAZAAR US, Carmel Snow—brought Christian Dior instant fame and made him an ambassador of a post-war ideal of hourglass femininity.